The Bentley Rhythm Ace FR8L and the Roland TR77 are more or less the same machine. 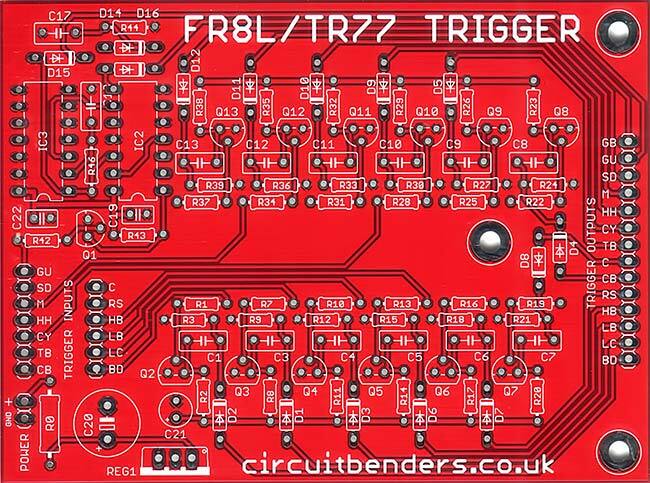 The only differences being that that the PCB's are in different positions, the FR8L doesn't have the tambourine sound found on the TR77 (although the empty spaces for the components are on the board and it can be installed), and the TR77 has a fade out feature along with 3 extra preset patterns. Internally the sounds are triggered using -12v spikes, instead of the standard +5v pulses used on later machines. 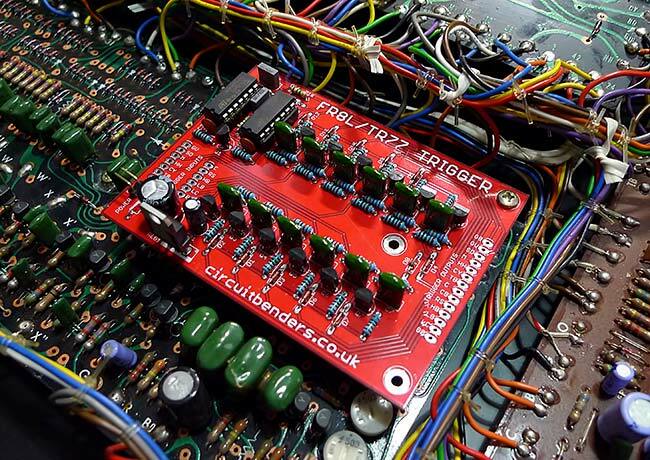 This interface board is designed to convert standard +5v trigger pulses supplied from an external source such as a midi to trigger converter, modular synth, drum machine or analogue sequencer, into the correct triggers to drive the FR8L / TR77 voices. The board has 12 identical trigger conversion channels, plus a trigger input with a pair of outputs to drive the Guiro sound and its associated pitch bend triggering. Whoever designed these machines went to a hell of a lot of effort to trigger the Guiro sound, and then only used it on a couple of the preset patterns! This is just the bare unpopulated PCB. We do not supply kits for the full build, but you can find everything you'll need at very good prices and with cheap fast shipping at Tayda Electronics in Thailand. Alternatively we can recommend CPC or Farnell in the UK, or Mouser and Digikey in the US. No doubt there are dozens or more suppliers that could be used, but you may find that some of the smaller sellers have difficulty with the 39nF (0.039uF) capacitors. Once you've populated the board, it needs very little in the way of setup. Theres nothing complex to go wrong, so as long as you are careful with your soldering theres no reason why this shouldn't be a beginners project. The build and installation guide can be downloaded from HERE. 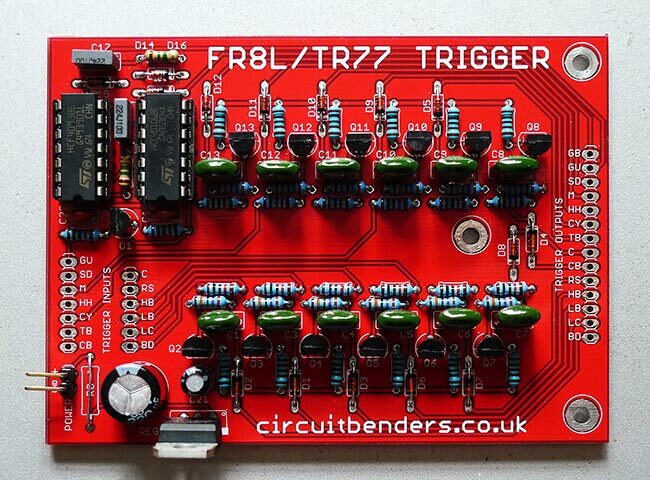 Below is a demo of a Roland TR77 being triggered via this board.